Ice Cream?! There’s no ice cream here today (we did that a few days ago) BUT this is almost better than ice cream! When I was 10, my sister Holly started working at the magical ice cream store, TCBY. During the summer, my best friend Jackie and I would ride our bikes there practically every week (to see Holly, of course!) AND to order the large ice cream parfaits. My layers to those parfaits typically consisted of brownies at the bottom, white chocolate mousse ice cream, oreos and more white chocolate mousse! We loved those things and at the time, riding our bikes to the ice cream store was our favorite thing to do. When I grew up and realized that those parfaits weren’t the best thing for me, I discovered I could make something that is a bit similar and SO much more healthy! I’ll admit, this is not an ice cream treat and so it doesn’t exactly equate to TCBY’s parfaits. But I will tell you that the first time I ate one of these things, I thought I was eating cold whipped ice cream with delicious candied granola… or something like it! That sweet yogurt and fruit parfait made such a statement, I’ve been enjoying these quite a bit ever since. They are pretty simple to make, yet taste so refreshing with your favorite fruit intermixed with the sweet granola and creamy yogurt. Since they are so easy to make, it’s a wonderful way to wake up in the morning, even with a busy schedule. Homemade parfaits that taste so good and are so pretty feel like a delicious dessert for a breakfast, brunch or snack! Wash and slice your fruit as needed. In a small bowl, mix together the yogurt with the xylitol. 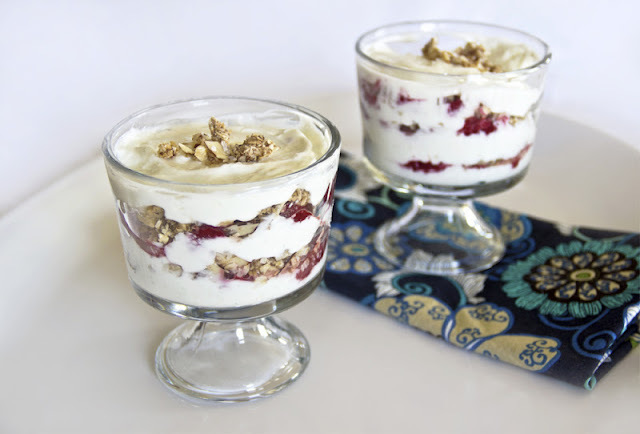 In 2 parfait dishes, glasses or bowls, begin layering the parfaits. Begin with the yogurt mixture, followed by fruit, then top with granola. Repeat this 1 or 2 more times. 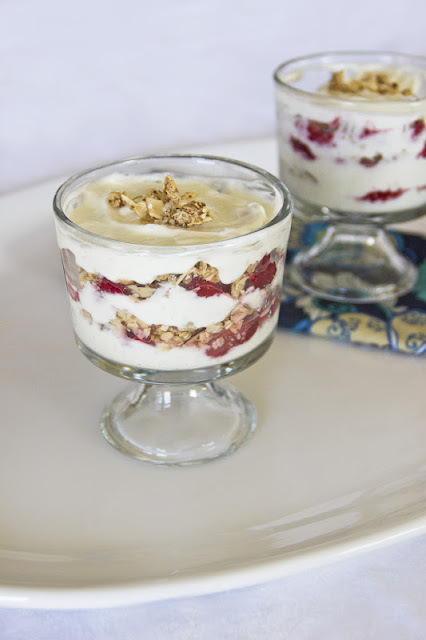 Top the parfaits with yogurt and sprinkle a bit of granola over the top for garnish. Enjoy immediately or chill in the fridge until ready to serve. Haha, TCBY is amazing, though I haven’t had it in years, so my tastes may have changed to not think so anymore. But as a kid, I went nuts over their white chocolate mouse. :) Now I just need to figure out how to give yogurt that flavor! Parfaits are the best fake desserts! I’ve never tried xylitol but like to use honey on my yogurt. They are, aren’t they? Xylitol gives a really authentic sweet flavor, I love it in this! Ooh I Love the idea of xylitol-sweetened Greek yogurt! I’ve been using xylitol in my raw breakfast cookies lately and it’s such a fab sweetener. Thanks girls! It is so fabulous! Raw breakfast cookies sound amazing! I will have to try that! Thanks, Hannah! I agree, anything cool right now sounds appealing! These looks delicious! I’ve never added a sweetener to my greek yogurt, but I should try it!